Sometimes the right people come together at the right time to make the right movie for the right audience. Certainly it happened in 1991 with Thelma & Louise, a film where each of its creative elements came together and resulted in a film that truly struck a chord with audiences and critics. A road movie, a buddy movie, a comedy, a tragedy, Thelma & Louise became an instant classic. Susan Sarandon and Geena Davis are perfection as Thelma and Louise, both delivering multi-layered and iconic performances. Harvey Keitel is their equal as Detective Hal Slocumb, and Michael Madsen, Christopher McDonald, and Brad Pitt are all excellent in supporting roles. Every creative component of the film is masterful – from direction, writing, acting, editing, photography, art direction, costuming – it’s all of a piece and that includes the great score by Hans Zimmer. Zimmer, born in 1957, had begun scoring films on his own in the 1980s, with projects such as A World Apart, Paperhouse, and others. But it was in 1988 that he got his big break, scoring the Barry Levinson film Rain Man. Rain Man was a smash, and Zimmer received his first Oscar nomination. Then came Twister, Black Rain, and Driving Miss Daisy, and since then he has been one of the most successful film composers in history, composing scores for such hits as Days Of Thunder, A League Of Their Own, The Lion King, As Good As It Gets, Crimson Tide, The Rock, The Prince Of Egypt, Gladiator, Hannibal, Pearl Harbor, Black Hawk Down, Batman Begins, The Da Vinci Code, Pirates of the Caribbean 2 and 3, Kung Fu Panda, Sherlock Holmes, Inception, and many, many others. He has been nominated for eight Academy Awards and taken home the prize once – for The Lion King. 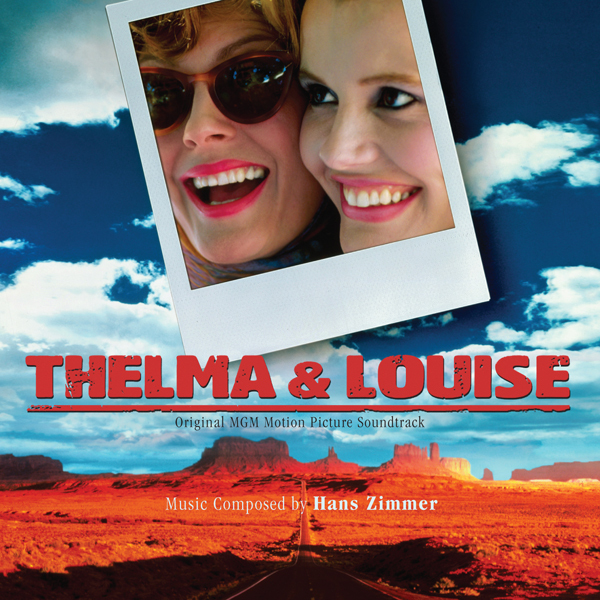 Zimmer’s score for Thelma & Louise captures Scott’s visuals and the tone of the film perfectly. While there are a fair number of pop songs used in the movie, it’s Zimmer’s twangy, mournful, exciting, hard-driving, bluesy music that really propels the film and helps give it its distinctive feel – and it features the absolutely mind-bending guitar work of the great Pete Haycock. Thelma & Louise had a soundtrack release on MCA that was all songs save for one four-minute track, “Thunderbird.” That track was assembled specifically for that album and was not used in the film in that form ever. It basically pieced together parts of three different cues to make the one four-minute track. For this first ever release of the film score, we present all the music as Zimmer recorded it for its use in the film. As sometimes happens, a few of the cues were shortened for the movie, but we left them in their entirety for the CD. As a bonus, we also include the “Main Title” cue exactly as it is edited in the movie (it’s comprised of two score cues). It’s a real pleasure to finally bring Zimmer’s wonderful score to CD – it’s been way too long in coming. This release is limited to 1200 copies only. The price is $19.98, plus shipping. CD will ship the last week of October – however, never fear, preorders placed directly through Kritzerland usually ship one to five weeks earlier (we’ve been averaging four weeks early).